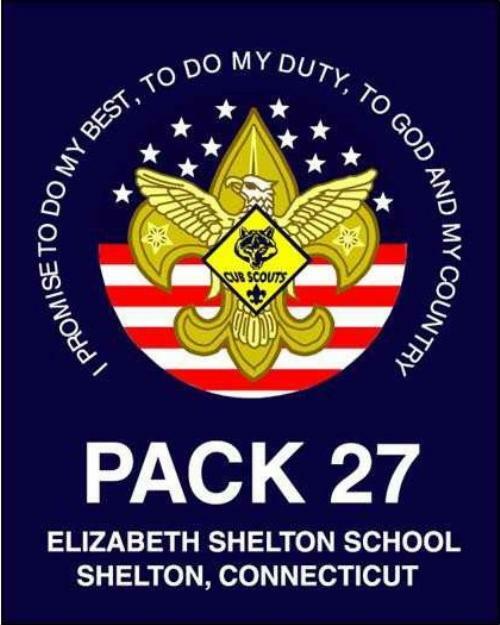 Cub Scout Pack 27 is located in Shelton, CT and meets monthly as a Pack at Elizabeth Shelton School. Dens meet approximately 1-2 times per month at the White Hills Rec. Center. For more information, please contact Pack27SheltonCT@gmail.com. All boys (all schools or home-schooled) are welcome to join! Cub Scouting is fun! No matter what grade you are in, first through fifth, it can be a blast. Do you like to learn by doing? This is just the place. You can learn to tie knots or how to set up a tent. Have you ever cooked a meal on a campfire? Sent a secret code to a buddy? Built a birdhouse? Hiked? Earn rewards for doing these things in Cub Scouts. As a Cub Scout, you will be part of your own Pack. The pack is divided into smaller groups called Dens. Each Den has about six to eight boys. All of the Cub Scouts in your Den are in the same grade. Have you been to the local police station and talked to the policemen on duty? Or visited the fire station and sat in the driver's seat of the pumper truck? These are some of the places you might go with your Den or Pack. You might also build a Pinewood Derby car and race it on the track, go camping, or march in the Memorial Day parade!